Lip Rejuvenation: Why Fillers + Micro-Needling Get the Best Result! Juvederm Ultra and Juvederm Volbella can give you the lips you've always wanted. These fillers are a type of hyaluronic acid - which occurs naturally in skin. It binds to and absorbs water to create full, beautiful lips. Your medical provider will inject filler into and around your lips. The effects will last about 1 year for each. Juvederm Ultra is a thicker formulation that adds more fullness and plumps thin lips - whether your lips have thinned over time or you simply want fuller lips. 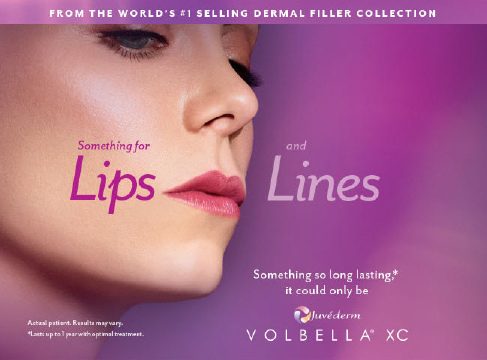 Volbella is the newest addition to the Juvederm collection. It's thinner and tailored to smooth vertical lip lines and add subtle volume to lips. These products will reduce the wrinkles around your lips, and enlarge and sharpen your lip borders. Both formulations include lidocaine to minimize pain. For more information, check out our blog posts, Juvederm and Hyaluronic Acid Fillers and Everything You Need to Know About Lip Rejuvenation Techniques. BUT, to truly get the best result . . .
you need fillers PLUS skin rejuvenation around your mouth. Read on to learn more about micro-needling and why it's the best choice for minimizing wrinkles. Medical Micro-needling is an extremely safe procedure. It is extremely effective because it both resurfaces and tightens the skin AND has long-lasting results. Down time is usually 1 day, although more than one treatment session may be needed. Most skin rejuvenation options work by causing mild injury to the skin. The body immediately starts to repair the injury by replacing the injured skin with new skin. The injury has to be just serious enough to trigger healing, but not serious enough to permanently damage the skin. Laser rejuvenation, chemical peels and other invasive methods are considered ablative, meaning they remove tissue to start collagen production in your skin. Lasers either remove the top layers of skin or remove only small parts / fractions of the skin (like a Fraxel or CO2 fractional laser). Both micro-needling and lasers result in collagen production that continues slowly months after treatment, but the lasers remove tissue resulting in a much longer recovery time. Micro-needling is better than lasers because it creates micro-injuries (tiny vertical channels in the dermis) without using heat (so there's a much lower chance of skin color changes after treatment). It doesn't remove layers of skin. This is why the skin heals so rapidly from micro-needling when compared to the recovery time from lasers. For this same reason, micro-needling is much less prone to infection. Why is a micro-needling pen better than other methods of skin rejuvenation?